Terry Chan Photography: Movie Review: "Knocked Up"
Lan and I went to AMC Santa Anita for "Transformers" but it was sold out! The next show is at 7:30PM and we have 3 1/2 hours to kill. 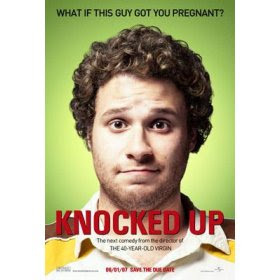 Fortunately "Knocked Up" starts at 3:15PM and we sneaked in to watch this movie in it's entirety. We had plenty of time to get out of the movie and wait in line for "Transformers". It was surprisingly funny. Seth Rogen and Katherine Heigl was electrifying as a on screen romantic comedy couple. But seriously, in real life, it's highly unlikely that Seth's type would hook up with Katerine's type. It's movie magic! Seth showed his range in this movie... first as a bum with no real direction in life. But everything changed when he realizes (with a lot of help from Katherine Heigl's character Allison) that being a parent means taking on new responsibilities. His character (Ben Stone) really took charge in controlling an angry OB-GYN doctor and a meddling sister in law. Lan and I loved the movie... a 2 big thumbs up.